When selling employer-sponsored voluntary health products, savvy clients often want to see evidence of the value if they add them. They don’t want to incur costs and added administrative burden to offer something employees don’t value. But for sales management, developing such evidence is a challenge. Presentations of internal data are often viewed skeptically by employers. For instance, they often assume that the data showing the benefits of a wellness program has been manipulated in some way to maximize a positive message. Searching online, sales management will find many free reports and whitepapers about employer group insurance. But these reports are almost always about what human resources and group benefits administrators themselves want, not what employees want. If insurers want to present objective information about what employees want, a recent employer-sponsored insurance study by Deft Research will help provide evidence of value to their employer clientele and prospects. Deft Research’s Special Report Employee Perspectives on Insurance Benefits: How Employees Value Traditional and Supplemental Benefits used responses to an on-line survey from 2,013 employees. The focus was to measure how many employees valued voluntary supplemental benefits. Indicators of value included current participation in these benefits, willingness to pay a higher payroll deduction to have the benefits, and the choices employees made between lean and rich benefit packages in a simulated plan selection exercise. The results could add realism to insurer sales propositions. They realistically show that some employees value voluntary supplemental benefits and some don’t. The report provides an estimate of the percent of employees who would value such benefits, and the percent who would enroll in a richer plan even if a leaner, less expensive plan was available. Halo Effects Measured with NPS provide another employer value. 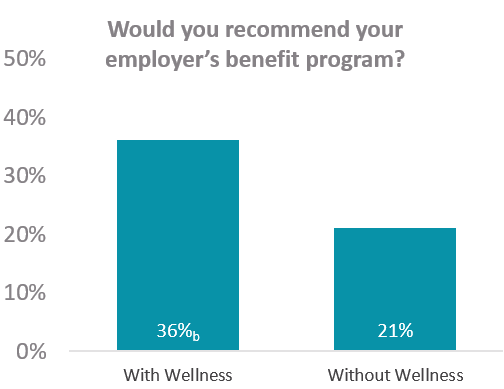 According to the report, some voluntary supplemental benefits generate a “halo effect” for the employer. This refers to the phenomenon where extra programs are associated with higher employee satisfaction among employees who don’t need and don’t participate in the programs themselves. Using Net Promoter Scores (NPS), the study measures how employees are happier with employers who take care of other work mates in need. Step 1: Identify your organization’s product strategy. Listed below are several strategic intentions for which this report can provide evidence of value. The intention to compete in the higher cost, greater choice market for group benefits. The intention to show employers how additional benefits could be a good financial strategy. The intention to provide on-line plan selection tools that make employee choice and subsequent administration more efficient. The intention to provide high performance narrow networks that employees voluntarily migrate into. The intention to bring more options to smaller employers. The intention to encourage employees to be better shoppers when making plan selections. If your organization’s strategy does not correspond to any of the strategic intentions listed above, we hope the research might serve to support your vision of the future. Step 2: Scan the report for relevant material. Even though an employer sponsored insurance strategy can take many forms, this report is bound to have measures and indicators that provide evidence for your value proposition. You don’t need to read through the whole report, use key word searches and the Table of Contents to get at what you need quickly. Step 3: Incorporate research findings into a sales presentation. In some cases, a research result can be extracted directly from the report and pasted into a sales document. But in other cases, sales management will want to use only a portion of the research presentation. For example, a chart showing results for Millennials, Generation X, and Boomers, may need to be trimmed to just Millennials if that is the only point of evidence needed. In still other cases, research results must be combined with other data: for example, your estimates of employee savings on fitness benefits can be multiplied by the research’s estimates of willingness to pay to arrive at an overall financial measure of value. Research is a tool supporting an organization’s larger agenda. Employee Perspectives on Insurance Benefits: How Employees Value Traditional and Supplemental Benefits does far more than just present more reading to its audience, it is designed with concrete value estimates that can help insurers make the case for expanded benefit packages and services. Users of this research are eligible for assistance from Deft Research’s staff. Should a different angle on the information be needed, or advice on presentation, Deft’s staff is here to help. Check out the preview slides: How Employees Value Traditional and Supplemental Benefits from the Special Report: Employee Perspectives on Insurance Benefits for more key findings.